The gloriously warm weather we have been enjoying throughout June and July is certainly visible in the vines. They have shot up and the berries are now pea-sized across site and approaching bunch closure in various places. Given that this is only our second season, the number of bunches is incredible to see - there are widely as many as three bunches per cane, and as many as four bunches per cane in some spots of the most vigorous Bacchus field! 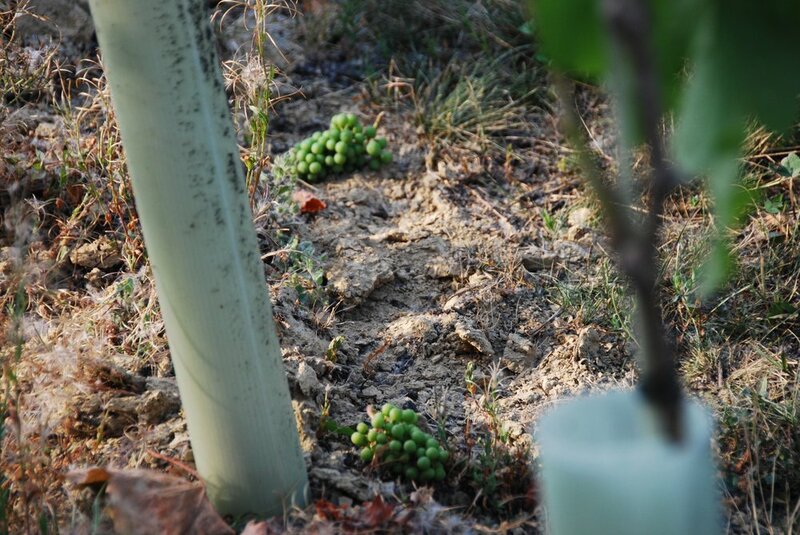 However, given the immaturity of the vines, we have to consider carefully the potential impact of the lack of rainfall coupled with the heatwaves. Our weather station last recorded rainfall on 31st May, 8 weeks ago. While this lack of rainfall has its benefits, including encouraging the vines to send their roots deeper into the soil, helping to ripen the berries and minimising disease pressure, we have to be responsible in terms of what to expect from our first crop. There is a risk that, in the absence of rain, all vegetative growth will cease and the canopy will be insufficient to support and adequately ripen the crop. Accordingly, we have decided to carry out some green harvesting, which essentially involves cutting off select bunches to ensure that whatever crop we keep can be sufficiently supported. While it's a shame to lose some fruit, it's important that we don't over-stretch the vines and that we're creating a sustainable foundation for many more fruitful years to come!